Stripe rust was reported out of Gallatin County this morning. It is important that you understand this disease and how it works, so that you can make the appropriate management decisions. This article will discuss the pathogen that causes the disease, symptoms, and some general management guidelines. Stripe rust is one of the most damaging foliar diseases impacting wheat production in the United States. 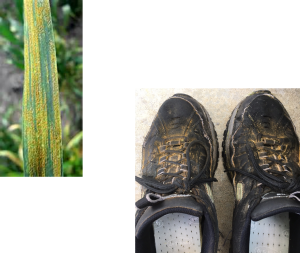 The disease is aptly named, as the fungus responsible for the disease, Puccinia striiformis, infects wheat and produces orange/yellow stripes on the foliage (Figure 1). Figure 1. 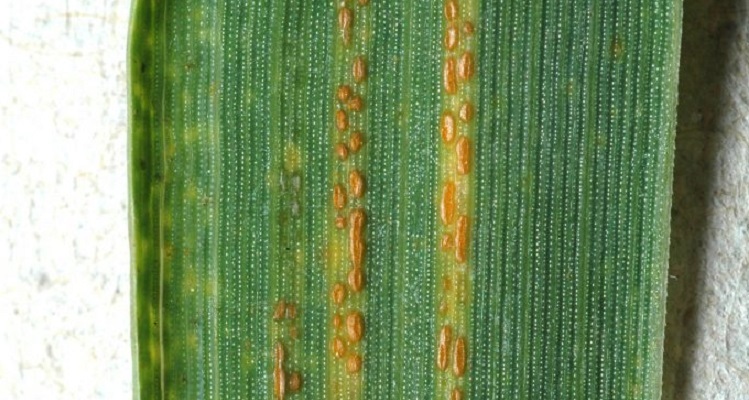 Stripe rust produces yellow/orange pustules that develop in a stripe-like pattern on the foliage. Stripe rust symptoms in R=resistant, MR, moderately resistant, MS=moderately susceptible, and S=susceptible varieties. Image from The Compendium of Wheat Diseases and Pests. P. striiformis is an obligate pathogen, meaning that it requires a living host to survive. Thus, it does not overwinter as resistant spores or fungal structures in residue as other diseases such as glume blotch or tan spot. The disease can persist in Illinois through the season on volunteer wheat, and under some instances can overwinter. However, it is much more common for us to see this disease move in from warmer southern regions. Conditions that allow the disease to overwinter further north can increase the likelihood that it arrives earlier in the season, when conditions may favor disease development and spread. 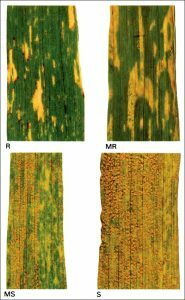 Unlike other rusts that affect wheat, stripe rust does best under cool (50-64°F) and wet/humid conditions. Under optimal environments the pathogen can infect, colonize, and produce new spores in 7-10 days. Thus, the disease may spread and increase rapidly under favorable conditions. Disease progress slows dramatically at temperatures above 70°F. Yield loss is related to the resistance level of the variety and growth stage at which infection occurs, with yield losses most severe when susceptible varieties are infected before flag leaf emergence and cool, humid/wet conditions persist. Management of stripe rust starts with the selection of a resistant variety. Many times stripe rust ratings are not available for the varieties we plant in Illinois. However, if you planted a variety in the past and had significant stripe rust develop, consider it susceptible to the disease. Resistant varieties likely do not need within-season management. Most wheat contains a leaf rust rating, which is not the same disease as stripe rust. A variety with an excellent leaf rust rating may still be susceptible to stripe rust. Cultural practices that can help minimize the likelihood of the disease overwintering in your area include avoiding early planting, and managing volunteer wheat after harvest. These practices can minimize the amount of local inoculum and reduce the likelihood for fall infections and overwintering. Fungicides containing FRAC group 3, 7, and 11 provide control of stripe rust. 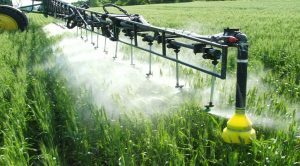 Fungicides are most effective when applied before the disease has established itself in the field. Before deciding if a fungicide application for stripe rust management is needed, check your variety, the stage of growth, and look for reports of the disease in the area. Also keep in mind the yield potential of the crop, and potential economic benefit from making a fungicide application. Additional inputs given current and forecast commodity prices leave little margin for additional or unneeded inputs. Resistant varieties typically do not require a fungicide. 1) Know your variety. Resistant varieties are unlikely to suffer significant losses from stripe rust. If you had a variety that developed stripe rust in the past, consider it susceptible to this disease. 2) Pay attention to reports. This means pay attention to scouts, agronomists, extension specialists, and media for reports of the disease. Note where it is located and if possible, the variety it was detected on. 3) Scout your fields, especially if you hear of stripe rust reports nearby, weather is forecast to be conducive to development and spread, and your wheat has yet to flower. 4) Apply a fungicide if you are at high risk for stripe rust, and only if you feel the decision is economically justified given the yield potential of your crop. Regarding point #4, this is never an easy decision to make. 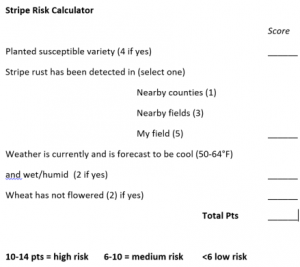 In order to give you an idea of your level of risk, I put together a Stripe Rust Risk Calculator. This is simply a way for you to gauge your level of risk for stripe rust development, and perhaps help you in making a management decision. Type in your scores on the right and add them up.